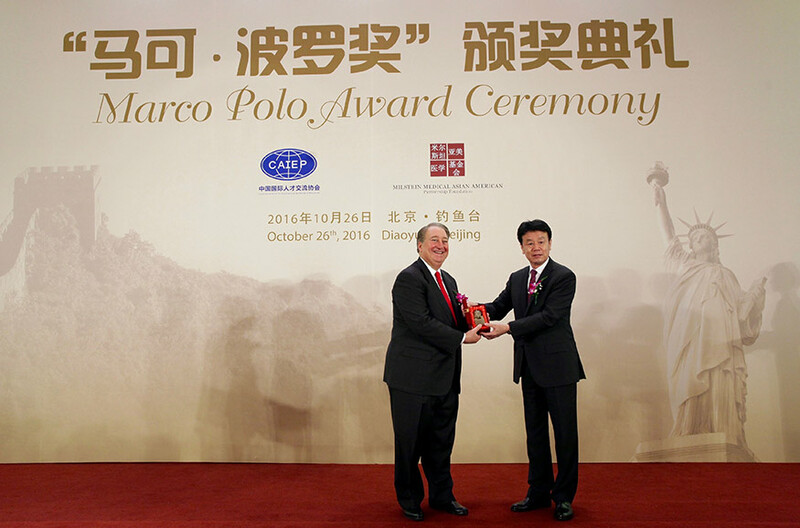 The Chinese government granted its prestigious Marco Polo Award to Howard P. Milstein, CEO of New York Private Bank & Trust and its operating bank Emigrant Bank, for his contribution to the exchange of international talents through The Milstein Medical Asian American Partnership Foundation. The award was presented in Beijing on October 26 at a ceremony attended by U.S. 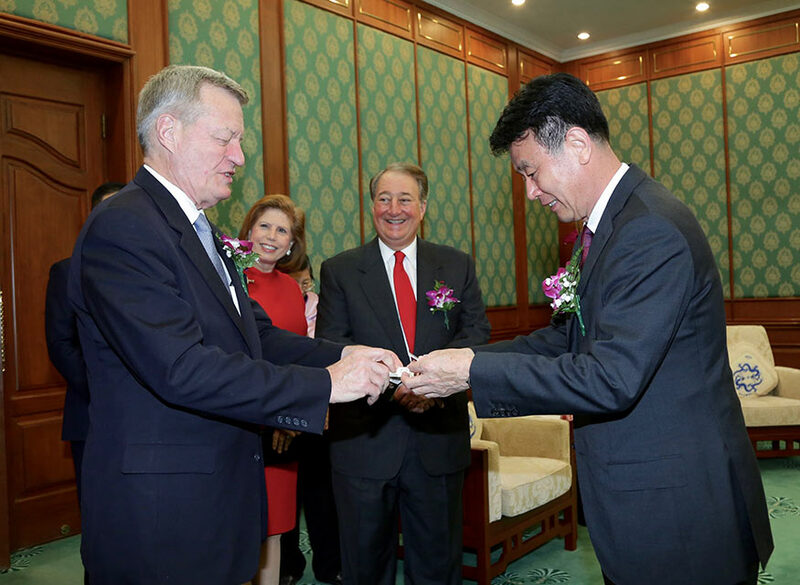 Ambassador Max Baucus and State Administration of Foreign Experts Affairs Administrator Zhang Jiangou, among other dignitaries. The Milstein Medical Asian American Partnership Foundation (MMAAP Foundation) was created by Howard Milstein and his wife, Abby, and the Paul Milstein family to contribute to world health by developing mutually beneficial partnerships between the United States and China, as well as other countries in the greater Asia region. The MMAAP Foundation provides funding to geriatric medicine, dermatology, hematology, translational medicine and reproductive medicine in the form of Fellowship Awards and Research Project Awards, which support medical researchers who have the potential to affect healthcare in China. It partners with more than 20 prestigious institutions in China, including Peking Union Medical College Hospital, the Chinese Academy of Medical Sciences and West China Hospital. Since inception, MMAAP has awarded more than 30 Fellowships and Project Awards to support the work of exceptional scientists and investigators with the vision, drive, and dedication to find new and innovative ways towards advancements in several medical fields. Mr. Milstein conceived of the MMAAP Foundation in 2011 after meeting with officials from the former Chinese Ministry of Health (now known as the National Health and Family Planning Commission) to facilitate interactions between his medical philanthropic interests in the United States and leading Chinese efforts in clinical care and medical research. Mr. Zhang made the presentation of the award certificate to Mr. Milstein, saying, “Mr. Milstein truly deserved this distinguished award” for this contributions. In accepting the award, Mr. Milstein spoke of his family history and its similarity to the foundation of China’s development. “The original values passed down by my father and grandfather guide our path every day. Hard work, integrity, ethics, planning for the long term and the commitment to help people are values, I believe, we share with the Chinese people,” he said. He credited these values as the basis on which the United States and China can continue to enhance their relations. 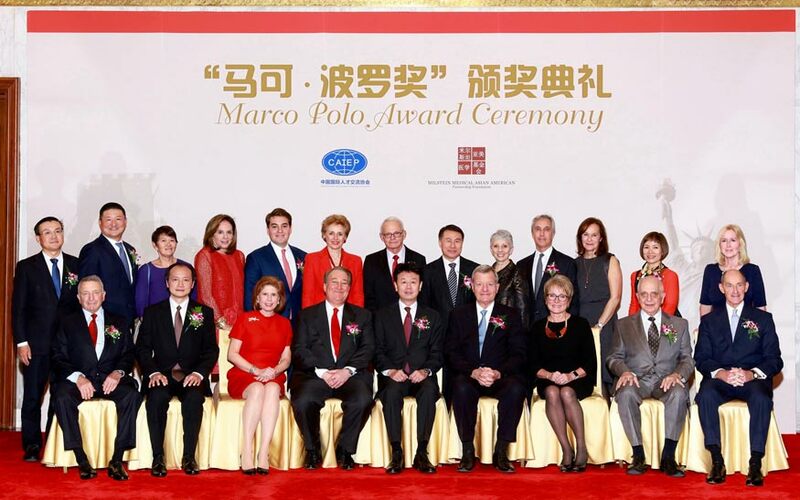 The Marco Polo Award, which was first given in 1987, is the highest honor an international entrepreneur can receive from the Chinese government. In the same way that the Italian trader and explorer connected the East and the West, the award recognizes those who have made outstanding contributions to exchanges between China and the world. Former U.S. President George H. W. Bush and Nokia CEO Rajeev Suri are among the recipients of the award, which is presented annually. Guests at the Marco Polo Award presentation. Abby and Howard Milstein, SAFEA Administrator Zhang Jianguo, and U.S. Ambassador Max Baucus and Melodee Hanes are seated in the front row (starting third from left, left to right). An interview with Howard Milstein about his family history with China and philanthropic activities in China can be viewed here or here (PDF).